If the above sounds a bit familiar, you’re not alone. Millions of travelers head out on spring and summer getaways without thinking about the health of their feet, which leads to soreness, exhaustion, swelling, blisters, ruined shoes, injuries and more. So save yourself the headache (and foot ache) by keeping the following things in mind before, during and after travel. Never pack brand new, unworn shoes. Since they haven’t been broken in, they could cause blisters, discomfort and other unexpected foot issues. Pack several shoe options and never wear the same pair of shoes two days in a row. This will help prevent foot problems and it gives you alternatives if a pair of shoes proves to be uncomfortable. Try to stick to flat, comfortable, cushioned shoe options with good arch support. It’s okay to pack a pair or stilettos or cute sandals for special dinners or events, but your feet will thank you if you spend most of your vacation in comfy shoes like athletic trainers. Pack a pair of flip-flops for use around the pool and in locker rooms. But use them sparingly: Though they can help you avoid bacterial and viral infections while you’re in moist public areas, they’re not a very healthy footwear option in general. Opt for shoes made out of flexible, breatheable material like leather, suede and cotton. They're soft, comfortable and help prevent foot sweat, which leads to slippage inside your shoe that can create rubbing, burning and blisters. Be prepared for unexpected foot problems like blisters, splinters and cuts by bringing a first aid kit with you. The travel kit should contain bandages, blister pads or moleskin, a topical antibiotic, tweezers and toenail clippers. 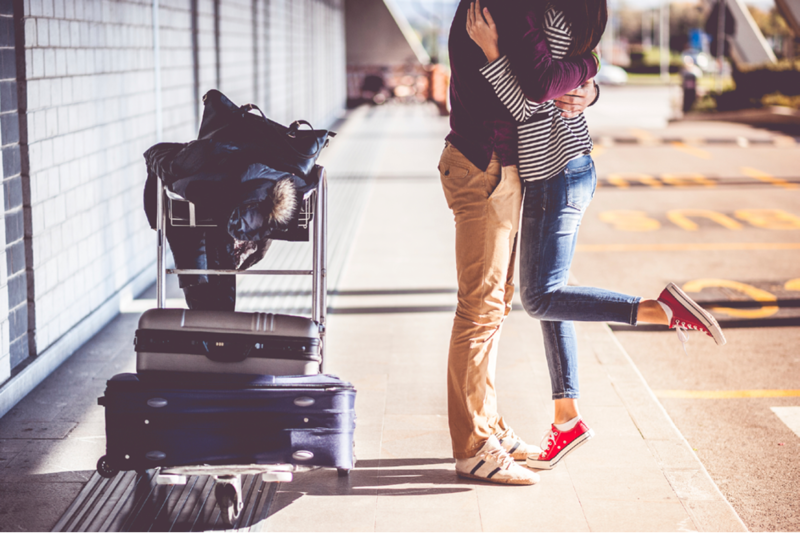 If you have any foot pain, problems or discomfort prior to your departure, be sure to get them checked out by a podiatrist or foot and ankle doctor before you leave. Taking care of the problem pre-vacation will ensure the issues don’t worsen while you’re away. This step is especially important for travelers who have diabetes. Make sure your feet start out in good health by properly trimming your toenails, scrubbing away calluses with a pumice stone and moisturizing your foot skin. Some people find it helpful to have a professional pedicure and/or foot massage done prior to a vacation. It can also be helpful to take several long walks in the weeks and months before your trip. This will not only get your feet accustomed to lengthy journeys required for a lot of sightseeing, but can also help you narrow down your most comfortable shoes. Long lines, unexpected mad dashes, and getting through airport security are vexing enough. Avoid additional discomfort and hassle by wearing comfortable shoes you can easily slip on and off. It’s mandatory to remove your shoes while going through security at US airports, so be sure to wear socks or put on the airport provided booties while walking through the metal detectors. This will keep you from contracting athlete’s foot, plantar warts and other communicable foot diseases. Bonus: If you choose compression socks, they could help ward off blood clots, foot swelling and deep vein thrombosis while you’re on the plane. You can help avoid foot swelling on long flights by spending a little time flexing and pointing your feet and toes both before and during your flight. It also helps if you stand up and walk around for a few minutes at least once each hour during the duration of your flight. Staying hydrated helps keep your circulation strong and can help reduce swollen feet while traveling. Bonus: Drinking plenty of fluids will force you to get up and walk to the restroom, which is good for your feet! It might be difficult, but try to elevate your feet while on the plane. Use any neighboring free seats or the foot bar on the seat in front of you. Propping up your feet will help alleviate any swelling adn soreness that has already set in. Crossing your legs further slows circulation, so try to keep your legs straight as much as possible when on the plane. Try stepping onto a bath mat or folded towel while exiting the shower. This will help you avoid slipping as well as from contracting any bacterial or fungal diseases that may be present on the floor. Hotel showers and floors aren’t always fully sterilized, so try wearing flip flops if you’re worried about plantar warts, athlete’s foot, toenail fungus and other communicable foot diseases. Your hotel may be the only place your feet get a break during your entire vacation, so use the opportunity of downtime to prop your feet up on pillows, apply lotion to your foot skin and gently rub your foot and leg muscles. Feet are often overlooked when applying sunscreen, but they’re just as susceptible to sunburn as any other part of the body. Therefore, in order to avoid painful burns and blistering, slather on sunscreen before hitting the beach or taking off to go sightseeing -- and don’t forget to reapply if you go into the water (even if your sunscreen says its waterproof). Be sure to drink plenty of water throughout the day, which can help ward off exhaustion and foot swelling caused by heat. Just as you did on the plane, try stretching your foot and lower leg muscles throughout the day. Frequent stretching can help keep your muscles loose and cut back on foot and leg soreness and cramps. Every activity calls for different footwear, so be sure to wear proper shoes for whatever activity you’re engaging in. 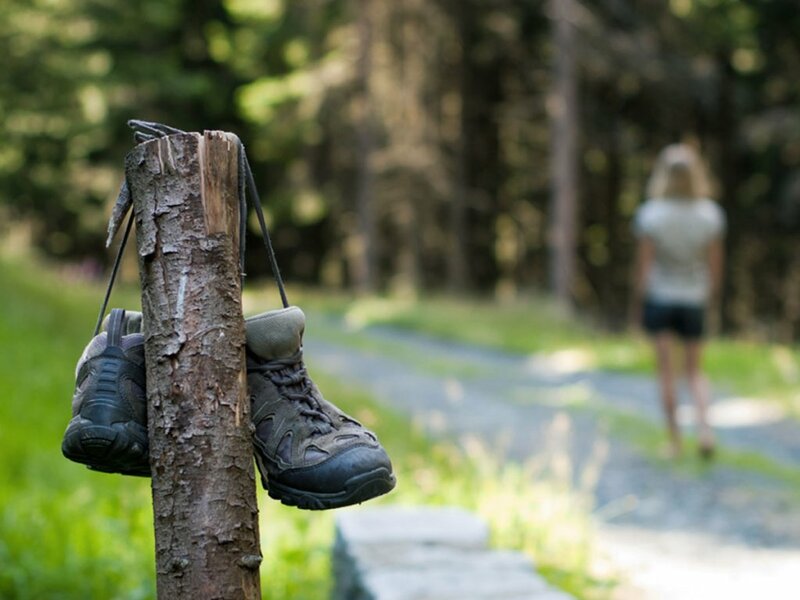 For example, light-weight, breathable athletic shoes are probably the best option for general sightseeing in urban areas, while sturdy hiking boots might be better for walks through rough terrain like rocky paths to waterfalls. It's easy to get caught up in the moment of seeing an ancient cathedral or mysterious, shop-laden street and — while oohing and aahing or snapping a photo — unexpectedly step off a curb or twist an ankle on a cobblestone street. There's a lot to look at while in a foreign land, but if you'd like to avoid sprained ankles and other foot injuries, the ground should also be on your list! Despite following the travel tips above, it’s possible that some people still might return home with blistered, callused feet. Follow these tips to help alleviate blisters and blister pain, and use a pumice stone to help you get rid of any calluses. Meanwhile, you may want to seek podiatric care if you had any persistent foot pain on your getaway. 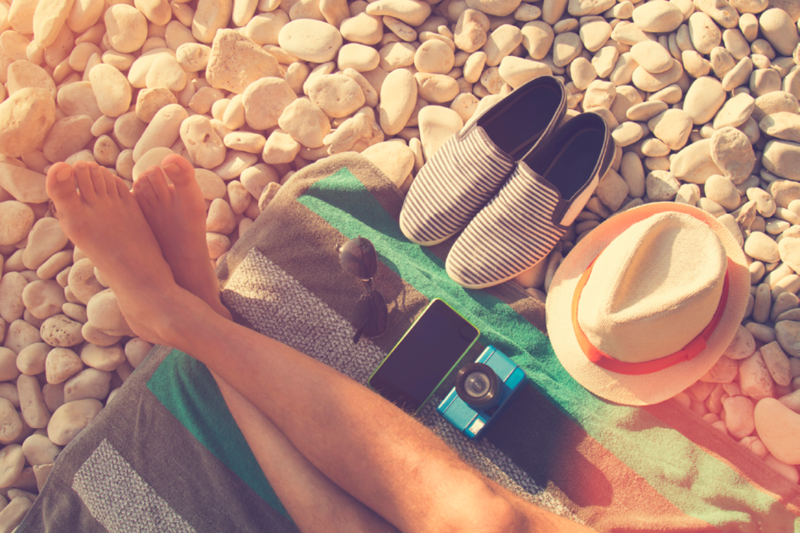 Now’s the time to purchase shoes for your next vacation so you have plenty of time to wear them in before jetting off again! Your feet really take a beating during vacations, so extend the relaxing atmosphere of your travels by pampering yourself with a pedicure and/or foot massage when you return home. Both you and your worn out feet deserve it!